Financial Times has a good read on the founders of Vostu, a game manufacturer for social networks, and what their experience was like attending Harvard Business School as entrepreneurially inclined students. Their experience reveals HBS to be an institution that isn’t suited to meet the needs of aspiring entrepreneurs. Mario Schlosser, Vostu’s chief scientist, recalled that there was a big “emphasis on taking the big job or following what other people have done.” Daniel Kafie, the chief executive, had the same impression. A lot of people walk into a programme like HBS thinking you’ve got it made for you and those are the people that end up in hedge funds and investment banking and consulting firms,” Mr Kafie says. “It’s very different to walk in there and say: ‘Hey, I’m here to meet really interesting people and to see if there’s an opportunity for me to work on some sort of entrepreneurship idea." The issue that Vostu’s founders’ experience at HBS brings up is the dissonance that exists between the spirit of entrepreneurialism and the more conventional culture of business schools. Persistence and the capacity to learn from failure, those are qualities best learned first-hand out in the enterprise jungle. Daring and self-reliance, two more entrepreneurial qualities par excellence, are either inborn or cultivated through practice. That these things can't be taught is well-established. But there’s a difference between what can be taught and what can be nurtured. The argument put forth by b-school administrators is that while business schools can’t teach entrepreneurialism, they can facilitate the cultivation of it in a relatively risk-free environment, while giving students access to a network of potential future contacts and advisors. Schlosser, straight out of Stanford undergrad and without experience, said he went to Harvard in large part to meet start-up partners. Which he did. 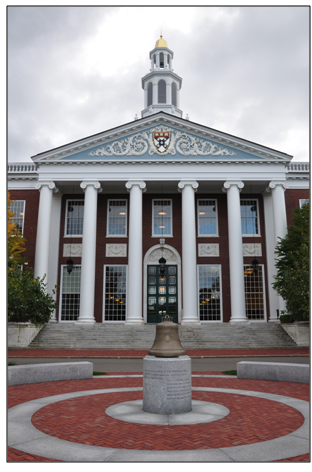 The founders also continue to reach out to and hire graduates of HBS. Reading the article, it seem like Harvard’s network was the best benefit Vostu’s founders got out of attending. Does Having a Mission Make a Law School Popular?